Check out week 4 and enter to win! Have a peek at a few scans from the book featuring some of my favorite designs from Chapter 3. 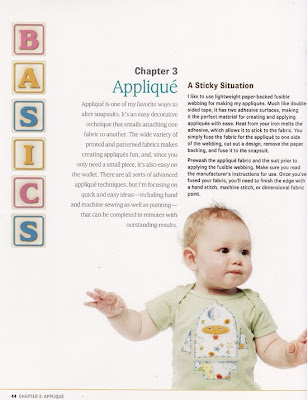 This chapter focuses on applique and has 10 different applique techniques and 16 different designs. Lots of basic instructions for first timers. Tons of goodies!!! $50 worth of scissors and designer fabric to get you started appliqueing. 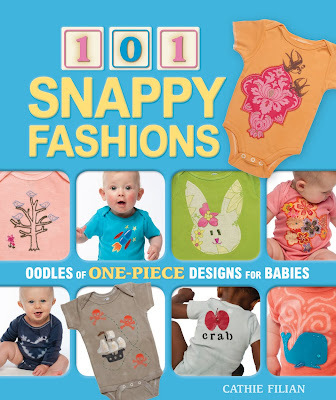 To enter: Simply leave a comment to THIS specific post by telling me if you have ever altered a baby snapsuit or if you have ever appliqued anything. some way of getting in touch will be disqualified. Deadline: Comments must be received by midnight EST February 28 st, 2010.
favorites, simply a game of chance. Note: The books will be in my hand at the end of February. All February prizes will ship as soon as I have the books. 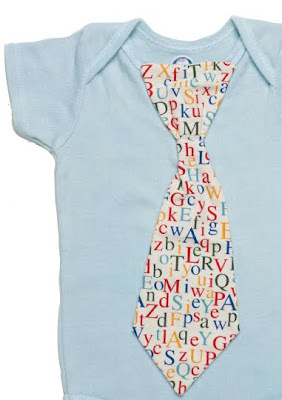 i've only ever gussied up a baby onesie like once, and it went horribly awry... i'd love the chance to win and redeem my crafty self by making some awesome necktie onesies! I have never altered a snap suit, but I did use fabric paint years ago!!! Wow! I love the doll fabric, woodgrain, and several others there. I have made t-shirts cutting out fabric motifs, using double sided iron on and finishing off with paint. 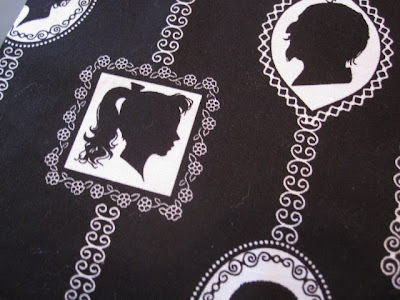 I've also stenciled memory quilt blocks with fabric paint! I think I'm a pretty crafty person, I have used fabric paint in the past. I would love to win this kit to make some onesies for my cousin who just had a baby. I have altered a snap suit with embroidery for friends that are having babies. I just started playing with fabric paints so maybe that's next on the list! For each of my friends who has had a baby in the past few years I have hosted a baby shower where we painted onesies using freezer paint stencils (stencils make it so much easier for craft-phobic people). The moms love it and I've promised to make the hand-painted onesies into quilts once the babies outgrow them. Thanks for all the great inspiration!! I have been playing with One-piece babie suite for a while. I have some really cute ones in my etsy store right now. I am known for my Owl Applique I designed myself. I think its super cute! I would love to win the contest and get some goodies to make my appliqueing easier. I am a huge fan and your new book looks fabulous!! When my daughter was born, I sewed little roses on the neckline of one snapsuit and more recently at a baby shower, one of the activities was to decorate a snapsuit for the impending baby. so we used stamps. I love to decorate little things. SWEET! I am actually in the process of putting ties on my 6-month-old's onesies now!! This is Awesome! I love to alter Onesies/snapsuits! Mostly cutesy stuff, like cupcakes and such. I have appliqued some for my granddaughters--would love some new tempting design ideas! 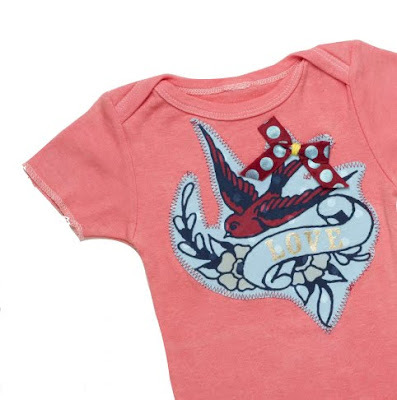 I love love the tattoo onesie, so adorable!! I have been altering snapsuits a lot lately, everyone I know seems to be having babies! I actually just started an applique wall hanging last night. I have altered onsies, but I have not yet appliqued one. It is on my to do list, though. I've never altered a baby snap suit, but I have tried my hand at applique. I'm not very good at it yet, but I keep trying! I would love to learn some new tips and tricks to make the process easier (and prettier). No I have never tried, but it sounds like fun! I made a couple snap suits for my niece, using leftover fabric from a quilt I made her. And I made some for my son with freezer paper stenciling. So fun! I just tried my first applique on my torn pajamas to hide the hole. (They're my favorite!) About to make some little onsies with applique ties for my friends new baby. I have done some fabric painting. Appliquing is on my to do list!! Thanks Cathie for all your craftiness!!! Awesome give away! I have done fabric painting. I have done some applique. I have never altered a baby shirt though! I used to do a lot of applique on wall hangings and art quilts. Quit sewing for a few years to work on paintings and sculpture, but I'm getting back into it again lately. There's just so much you can do with it creatively. I altered a onesie to make it piratical. Tea-dyed it, and used fabric markers to write "Yarr!" and other sayings on it. Heh. camelama at gmail dot com. This book is so great! I have used applique on a few pillows. I love the look. I have just the baby in mind for these adorable onesies! What an awesome prize! I haven't tried applique on clothing yet, but I have done some on canvas totes. I am a beginner sewer, but found a tutorial on appliqueing (is that how it's spelled?) and have been wanting to try! This book is definitely on my wishlist! I have never altered a baby snapsuit or appliqued anything but would love to start!!! 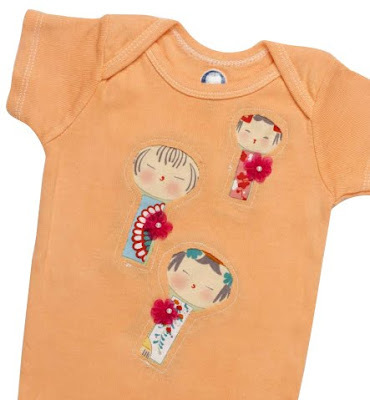 How I love applique, let me count the ways.......every seamstress in their 30's must learn to alter Onsies, it's the baby shower staple! Thanks so much for the opportunty-- what a bundle of creativity! I still have not altered a snapsuit/onesie, nor have I appliqued anything! I really need to do that! I can't wait until I get the book in. I purchased to fiber reactive dyes yesterday so I could start dyeing some. I really want to make cute clothes for my little boy. I just got done doing about 2 dozen iron transfers and appliques for my 2 grand-nephews. I had a blast and would love to continue doing so. I've done iron-ons. That's kinda like an applique, isn't it? We have two new babies in the family and your book looks like it will be a great springboard for creativity. Never done anything to a snapsuit except wash it. But I appliqued my jeans in high school - in the 70s - with peace signs! I have appliqued on quilts and on some shirts but never on a onesie. Gives me a great idea for a baby gift due in mid-March. I have appliqued and refurbished onesies, but I'd love a book of ideas and tricks. Thanks for the giveaway! Nope, never have, but hey, you gotta start sometime, right! I've never altered a baby snapsuit but have appliqued. Would love to get more crafty. I decorated a bunch of onsies for my niece 2 years ago. My second niece decided she wanted out early so I haven't had a chance to do anything for her yet. lol. Thanks for the chance to win a cool bunch of prizes. Nope I have never done either but I do have a 7 month old granddaughter and another on the way so I would love to learn how. I think the only time I did anything that may be considered applique was when I made a square for a quilt. I crocheted a heart shaped doily and sewed it to the square. Don't know if I did it the right way, but it did look beautiful. I have never appliqued anything before. I haven't had the chance to applique but would love to. We have several babies due at work this year. How cute would it be to give gussied up onies. I've never appliqued either but willing to try! Very cute stuff!!! About a million years ago it seems.. I turned one of my son's snappy baby tee's into a fan t-shirt for our favorite Christian bands with some permanent ink and letter stamps. We went to a concert with our little baby in tow and the guys in the band signed his little t-shirt making it even more special! Never to both, but I love trying new things! Those designs are super cute--what a great idea for a baby shower gift! I once altered a baby onesie that was too short. He ended up wearing it till he was almost 3! I would be i heaven if I won! I love to alter baby clothes and did quite a bit for Dyllan when he was little! I haven't really appliqued anything - mostly just iron-ons and then sewed them down. I recently made a diaper bag and some onesies that matched the bag for my niece's first child. Onesies are the great for jazzing up, I'd love some more ideas; your book sounds perfect. Especially since all my friends are becoming grandmas lately! I have done both - love it!! Can I also say that I am going to have to go to my local quilt store, Whistle Stop Quilt Shop in Selma, NC to see if they have these fabrics! I love them and with three kids and one on the way they are perfect! I have done some painting, but I'm am super excited to give applique a try! I've never done a baby snapsuit but I used to make my mom t-shirts or sweat shirts for holiday gifts by painting and applique.I also made an applique Christmas tree shirt for a resident in a group home where I worked because he wanted one.I used one of his shirts and cut some fabric I had into a Christmas tree shape and used fusible webbing to attach it. Then I trimmed around the tree. Fun stuff! I love your goodies! Yep have altered a onesie (that is what we call them) at a babyshower! Thanks for the opportunity to win! Yes, I've altered a snap shirt, mmore than once. I have used iron on from the printer, embrodered some flowers for a girls top and also did a cute skirt around the waist to make it more dressy for a girl. 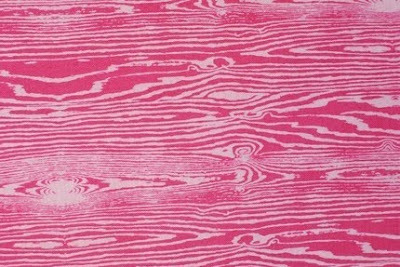 I hand sewed a gathered 45 by 8 inch printed pink material to one. After heming the other side of course. It turned out very nice, if I do say so myself. I have never altered a onesie, but my friend found out she is pregnant this week, so this seems like a good time to start! Great ideas. I love to paint on fabric for my grandbabies. I have never altered a onesie, but I have altered t-shirts for various holiday seasons. My sister had a baby a few months ago, so this would be an awesome thing to try. I have never altered a snapsuit before, but I have made a couple crazy quilts that used applique, and I've made a few aprons for myself and for gifts that used applique, like some sugar skulls I cut out of fabric and appliqued onto a black apron for my Mexican friend. I also made a fabric book cover once and appliqued a large felt tree onto the front. SO much fun, but I haven't done enough of it lately! Thanks for the inspiration! No and no, actually I've been waiting for your book to help get me started! Been a blog follower for quite sometime so I've known about it since you first started posting about it. i took my month old son to cheer the avon breast cancer 3 day walkers. i painted "go go go" on his onesie rear so the walkers could see it. he gave many exhausted walkers a much needed laugh! i just stenciled a onesie last weekend, and have embroidered burp cloths before, but otherwise, not much. i love the hip stuff you are offering and would definitely make my BFF more onesies with these goodies! I painted some hearts on snap suits (onesies) for my son's teacher when she was expecting her first child. I bought several sizes so that she could grow into them and the mom would appreciate my gift at each stage of her daughter's infancy. She loved them! Have never altered a baby snapsuit, have thought about it, but no babies to wear them right now. All my Grandbabies are out of onesies. But have appliqued alot of stuff. Fist thing I did was a Jean shirt for my mother of Noah's Ark. I love applique. I have appliqued many things; my most fav was a jean jacket I wore for years. I've never altred a onesie but now that I have 4 mos old identical twin boy grandsons it looks like I'll have a chance to try my hand. Can't wait to see your book. Love! Love! Love the ideas for the snappies. I have appliqued before but have not done so for my little girl. Would love to start. doloresmh@gmail.com btw, I record all of your shows! My mother-in-law is an extremely talented quilter and she taught me to applique some twenty-two odd years ago. I was pregnant with my first daughter. I made a mallard duck and trout appliqued pillow, at the time I was into the whole log cabin, forest theme (I was and have been inspired by my brother and his family living in the Sierra Mountains). I still have the template(s) for those pillows, and scraps from the material I used (darker calicos of red, blue, green, brown and yellow). I also have two grandchildren now, just under two years old - Hollis (g)May and Colton (b)June, one from each of my two daughters. I'm always looking for the cutest onesies for them! ps I LOVE YOUR SHOW! I have appliqued on tote bags and shirts and bibs but have not appliqued on a onsie before. I haven't tried applique yet, but I've always wanted to! and to try it on cute baby snap suits would be a lot of fun! 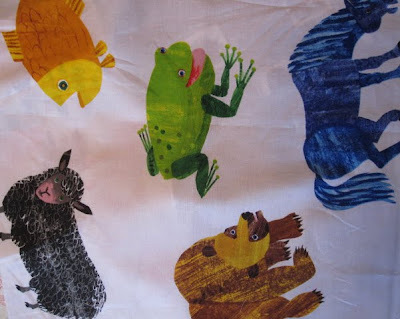 i've used fabric paint (didn't do a great job) but i would LOVE to try applique. Applique looks like a lot of fun to try. My husbands grandmother still appliques a little and i would love to win this gift so she can show me how it's done. After loosing my grandfather-in-law i'm realizing we are loosing a wonderful gift from the elderly and i want to learn from the best!!! I have never altered a baby snapsuit nor appliqued anything. But I am trying to learn applique, sewing, and other crafts now that I have little ones. I have attempted fabric painting, stenciling, and dying. Hi! I've never altered a baby snapsuit before, but I would love to give it a go. So cute! At my sister's baby shower, all the guests painted onesies for her baby. That was over 5 years ago. They all turned out really cute, even the people who said they weren't creative. 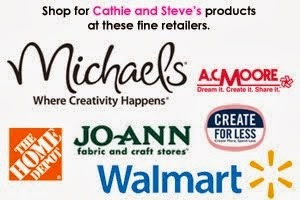 We put out paints & stencils & stamps & fabric markers. It was fun! Please count me in for giveaway 5! I haven't decorated a snapsuit, yet, but have a brand new niece and another one coming in the summer, so this timing is great! Thanks!